As a Fort Wayne native and lifetime resident, Heidi Kleinrichert has a vast knowledge of the area and local community. Heidi attended Southwest Allen County Schools and was blessed with a great education, lifelong friends, connections, and a wealth of confidence and competition. While in school she was the secretary of her class & played varsity sports. Upon graduation, she attended Indiana University. At IU, she was on the Dean’s list. Heidi received a degree in English Education and graduated with distinction. She married her high school sweetheart and has been blessed with three children, Kole, Karsyn & McKenna. The small gap in her career stems from staying home to give her children a strong foundation during their early formative years. Recently, while purchasing a new home, the buying agent recruited her to join the wonderful profession of real estate. 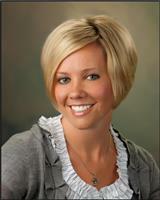 She enrolled in Troyer Real Estate School and passed her state exam in January of 2010. Heidi loves networking and finds it exhilarating to discover people’s wants & needs in real estate and help them satisfy those requirements. Heidi’s goals and objectives are to provide excellent, professional, personal service to all my clients while being part of a real estate team of professionals who help one another grow.